Did you catch part 1 of this blog post? Find it here. Remember, there is no age limit for someone to learn functional communication skills, and it will take time, patience, and a lot of effort. Many individuals with a developmental disability learn that making certain vocal sounds earns them access to certain items. Pros: The caregiver and a few other key people are able to understand what the sound means, and therefore communicate with the child. Cons: While functional, this type of communication significantly limits the audience. Only a very few people will understand what these sounds mean. Individuals learn to point at objects as a way to ask for something. Pros: If reinforced, this may help in situations where an individual is seeking an item. Cons: The child may engage in problem behavior if they’re unable to point to the object because it isn’t accessible. Pros: Remedies a limited vocabulary, as the individual can carry around a vast amount of familiar pictures they can show to others. Cons: Portability issues. The book may become damaged, get lost, or be left at home by mistake. Also, care must be taken to make sure the individual understands how to use a particular picture to communicate a want or need before introducing a new picture. Tablets and other devices have software that digitize PECS, and can provide a vocal output to written words or pre-programmed phrases or allow for tactile input for those with both language and visual impairments. Pros: Remedies a limited vocabulary, as the individual can carry around a device they can show to others. New pictures can be easily added. It may also give the individual a “voice” as it can speak whatever they input into the device. 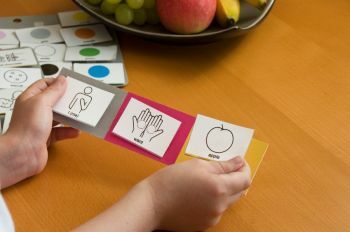 Cons: Much like PECs, each picture, word, or tactile input must be taught one at a time before someone can use it reliably to communicate with others. These devices can also suffer from portability issues such as being lost. These devices also tend to be expensive. Sign language is an excellent way to communicate one’s wants and needs without needing the actual item to be present. Pros: No portability issues. The use of sign language follows the individual everywhere. Cons: Limited audience. Not everyone understands sign language. Each sign must be independently taught until the individual can reliably use it to communicate. Finally, some may have the ability to say words, but aren’t able to use them in a socially appropriate manner. It’s important to make every attempt to build vocabulary by teaching to use words in a functional way. Pros: The ability to communicate with words can be used with a larger audience and it doesn’t suffer from portability issues. Cons: None. If your child has the ability to form words, teaching them to use those words can provide great benefits to everyone involved in the care of that individual. Finally, it may be beneficial to teach two strategies. For example, an individual may learn how to use sign language and PECS. This way, the individual has a backup style of communication when someone may not readily understand his or her preferred method. Familiarize others with how your child communicates. If your child learns new strategies from school or a clinician, make sure you reinforce those strategies at home. The more a technique is reinforced across environments, the more likely the child will use it. There are professionals that can help: behavior analysts and speech and language pathologists are two types of specialized clinicians who can teach functional communication strategies. Many of these professionals are employed in school settings, outpatient clinics, and by in-home providers, and are usually readily available to caregivers. Caregivers should use all resources available to them for support and never give up. The end result of an individual learning how to communicate appropriately without engaging in problem behaviors is a rewarding experience for everyone involved! Most importantly, the improvement in the quality of life for that individual is invaluable. Looking for more behavior management tips from Tom? Click here. 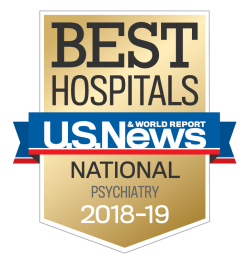 Tom Flis, MS, BCBA, LBA, LCPC, is a senior behavior specialist with Sheppard Pratt Health System, working on the Adult Neuropsychiatric Unit, which offers specialty care for adults with developmental and/or psychotic disorders. Tom is a board certified and licensed behavior analyst and a licensed clinical professional counselor who has more than 12 years of experience working with children and adults diagnosed with a developmental disability.